This post is made possible by energy-efficiency specialists WellHome and their Home Weatherization Giveaway Sweepstakes. Take a quick visual quiz of your home’s energy use to see your potential yearly savings. For your shot at a grand prize of $2500 in energy efficiency upgrades, enter by March 20. Using the power of the sun to heat your water is one of the simplest ways that you can make your home more energy efficient. Heating water usually accounts for 40 percent of an average family’s monthly energy costs. Converting to inexpensive solar thermal water heating is a great first step that will not only allow us to utilize a much more clean, affordable and sustainable source of energy, it will also create jobs and help our nation to become more energy independent. Solar power has been a top priority for Israel since the founding of the nation; solar energy ordinances have been in place there since 1980. Israel was the first country to make solar thermal mandatory in all of its new residential buildings. The plan was to reduce the country’s dependence on imported energy, since the country has no oil reserves, but sunshine is abundant. 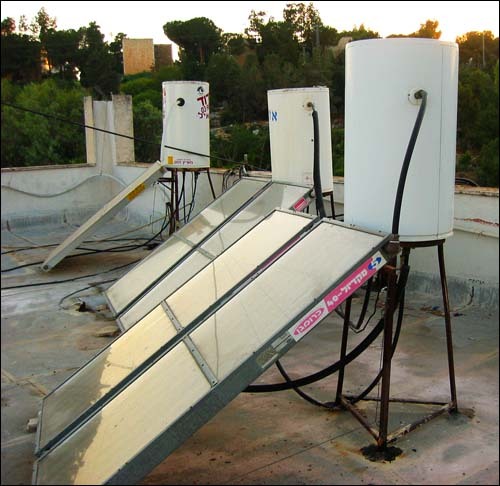 Nearly every Israeli roof top is equipped with at least one simple solar water boiler. According to a study by the European Solar Thermal Industry Federation, today Israel’s extensive network of solar heating systems provides over 8 percent of the country’s energy. A combination of economies of scale, coupled with the widespread awareness and education has led to tremendous cost reductions for solar power in Israel; the average time that it takes there for the energy savings to pay for the cost of solar installations is only about three years. These days solar thermal water heating systems are just a normal component of almost every household in the nation. Nearly 90 percent of all Israeli households use solar thermal energy to heat their water, and many building are entirely powered by the sun. The arid country is not only a world leader in solar thermal energy use, but also in water recycling and clean technology. Relative to its small size, Israel has invested more of its resources into waste water treatment and reclamation research than any other country in the world. A whopping 70 percent of its used water is now recycled. All of these many innovations have made the country one of the foremost leaders in sustainable energy, and prove that clean energy is not only viable, but necessary. However, as energy and heating prices continue to soar, Israel’s many inspiring progressive clean energy accomplishments also demonstrate just how very far behind we are here in the United States. Our nation must invest in creating a vibrant solar energy network now; it just makes sense. How Much Does a New Boiler Cost To Buy & Install? How Much Does Double Glazing Cost For Your Home in 2018? Double Glazing Grants – What Help Is There? Solar Panel Costs: How Much Should You Pay in 2018? What is the Cost of Invoice Factoring? Who Are The Best 10 UK VoIP Providers For Your Business?